I’ve always enjoyed watching kite boarders while driving through Hood River, Oregon. Now that Brian and I live on a sailboat half of the year, I wanted to learn this intriguing sport. Plus, Brian already does this and has all the gear on board. I assumed this new sport would soon be mine. I’m a sporty girl. I’ll get this. The internet says it’s an easy sport. You can learn it in just three days, says the internet. This is a challenging sport, especially if you come to the table with no skills, like I did. I had no kite skills, no board skills and had never been out in big ocean waves. All these things had to be learned before I got up on the board. Initially, all I had going for me was comfort in the water. Even that comfort was tested when my face was pulled into the waves over and over by the giant kite hooked to my waist harness. I showed up in La Ventana full of stoke for this new sport, and promptly signed up for three days of fast paced, expensive lessons. Unfortunately, the lessons didn’t really “take”. I finished up the lessons feeling confused by the kite and too nervous to fly it solo. I needed my instructor hooked to me, telling me what to do, or I would freeze. What was wrong with me? The internet said I could learn this in three days. Brian reassured me it took him longer than three days to learn, and that I was doing fine. But he didn’t feel what I felt flying the kite. He didn’t freeze like I did. I didn’t understand the kite, and didn’t like its unexpected yanks. 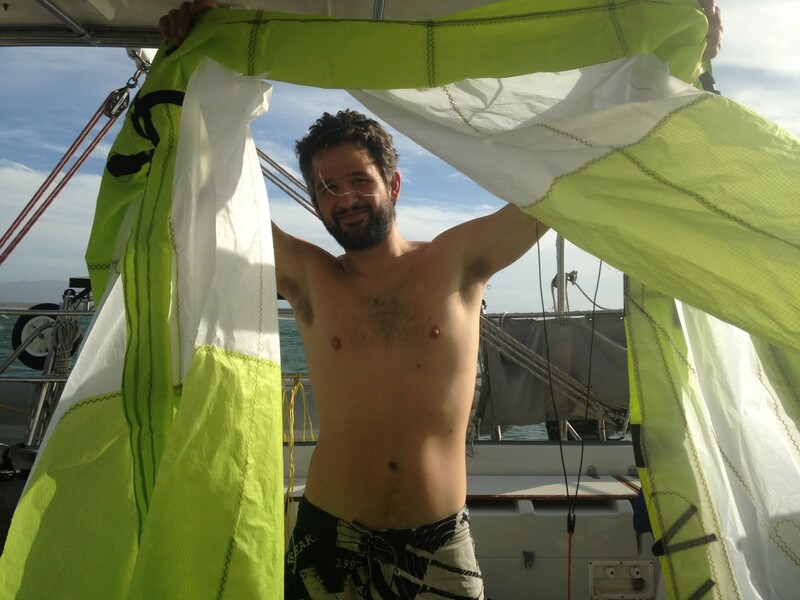 Then, I got hurt by one of our kites on the boat. Brian was launching the kite from the boat with a long rope attached to it. It was a windy day and things went wrong. He screamed “Lisa! Help!” from the cockpit. I raced outside and found him struggling with a rope which was attached to a crumpled kite. The deformed kite was whipping around with incredible force. I grabbed the rope to cleat it off, and then a gust of wind filled the kite and there was no way I could compete with its power. 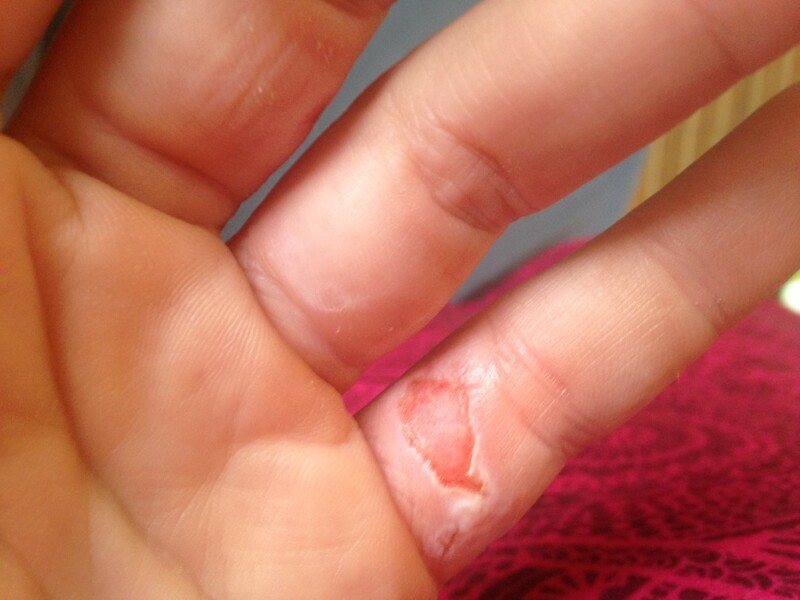 The rope ripped through the top layers of skin on two of my fingers, hit Brian’s neck, and knocked him into the ocean! Brian got back on the boat and we carefully contained the kite. Once it was back on board we surveyed the damage. The kite’s canopy had a three foot tear. I gave my fingers a few days to heal and tried another lesson. I didn’t want to give up, but the lesson went poorly and I didn’t make any progress at all. I was failing. This sport I wanted so much was slipping through my fingers and it was tearing me up inside. I didn’t know if I wanted to keep investing money in lessons that were going poorly. It might be best to back off, and I felt very sad about retreating from this dream. Should I give up now before we spend more on lessons? Am I just too nervous to do this? I posted a question on an internet forum for kiting, and got over 40 responses. I read the responses several times and realized I still had potential to learn this sport but I needed to master the kite on land first. Flying the kite in the water before I knew how to control it had stressed me out and taught me little. Of course I was nervous. An unknown entity was yanking me around in the water. I would need hours of practice with a small kite to gain the muscle memory I would need to perform the basic tricks with a larger kite. I would start with a small kite that pulled gently and learn the moves while standing comfortably on the beach. I also needed a more structured learning environment. I needed detailed descriptions of the skills I would perform while I was on land and relaxed. I couldn’t absorb much information with a yanking kite strapped to my waist, waves in my face and my instructor tethered to me. The fast-paced, immersion method of learning hadn’t worked for me and instead had backfired. 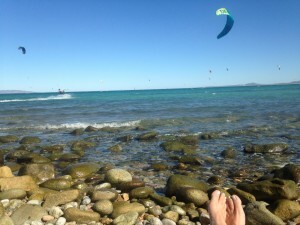 I had moved forward with my lessons and started doing things in the water with little understanding of kite skills. According to the opinions on the kite forum, this was killing my confidence and making it harder to learn the kite. Everything was wrong but I was starting to figure out how to make things right. Maybe I still had a chance at this sport, but I would need to proceed carefully and intelligently, not just throw myself at it without a plan. I bought a two meter, two line kite and flew it every day there was wind. 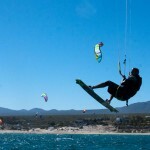 I worked to master a set of tricks that had been posted in the kiting forum, like figure 8’s and power strokes. I loved my little kite and named it “baby kite”. I flew baby kite until I could fly it one handed or without even looking at it. I flew it until I got bored with it. Brian and I went to a nearby kite shop, and the shop was so friendly I started going there for coffee and meeting other kiters. I met hesitant kiters who had to work to overcome nervousness about the kite, and fear of crashing. 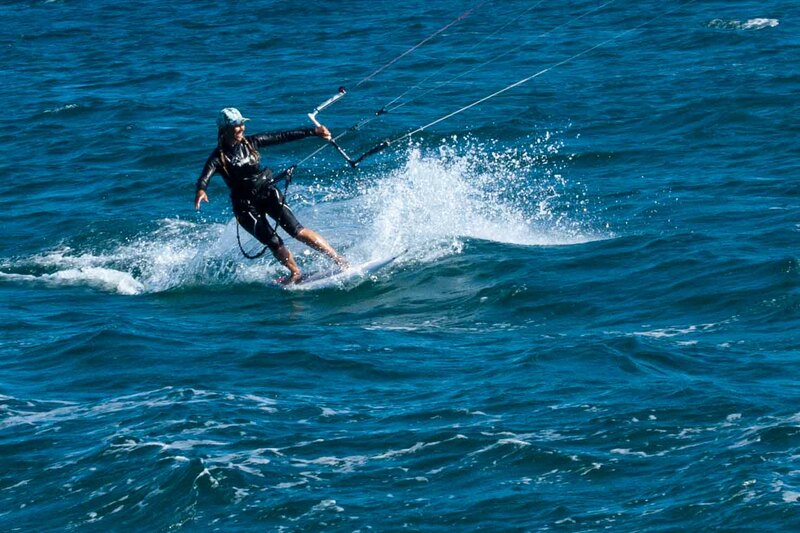 They took lessons, practiced, and mastered simple kiteboarding. They loved their instructors. I felt encouraged. These were not abnormally athletic or brave people, but they had somehow conquered the kite and board. I read through the friendly kite shop’s entire website that night. 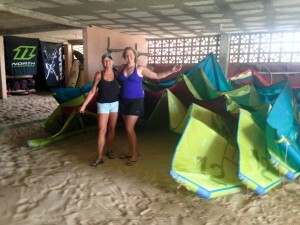 They had a three day girl’s kiting camp starting in just a couple weeks! I signed up. 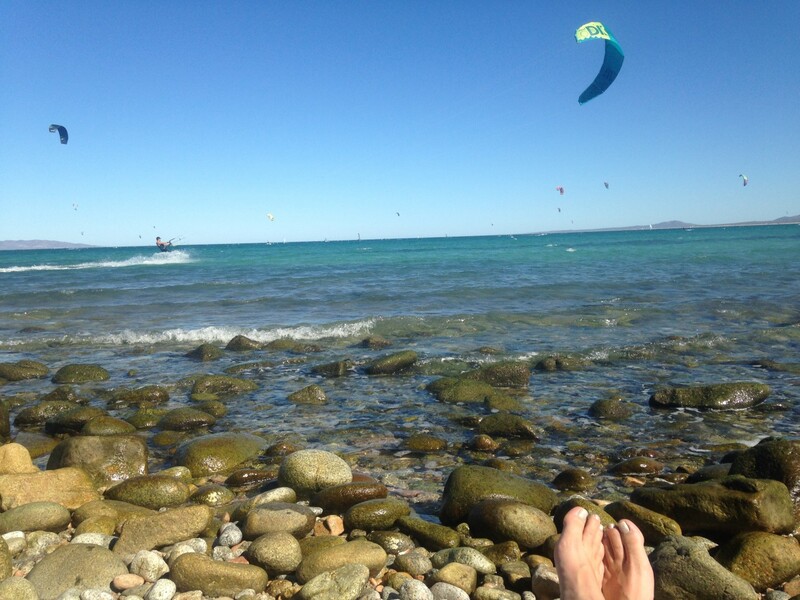 This would be my best chance to regain my stoke for kiting and learn in the most comfortable environment possible. 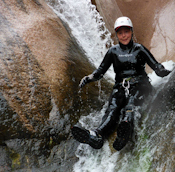 I’ve experienced a couple all women’s canyoneering fests, called “Chickfests”. I’ve seen hesitant women do amazing things in the supportive environment of the Chickfest. I needed a kite boarding Chickfest. Now, I was the hesitant one. Please, universe, bring me a good instructor who can help me overcome my fear of the kite. I’ve been paying it forward for years. I’ve been teaching people to rappel and canyoneer. Now, I needed someone to teach me kite boarding, to somehow rekindle the dying flame of this kite boarding dream. And then I met Kris. 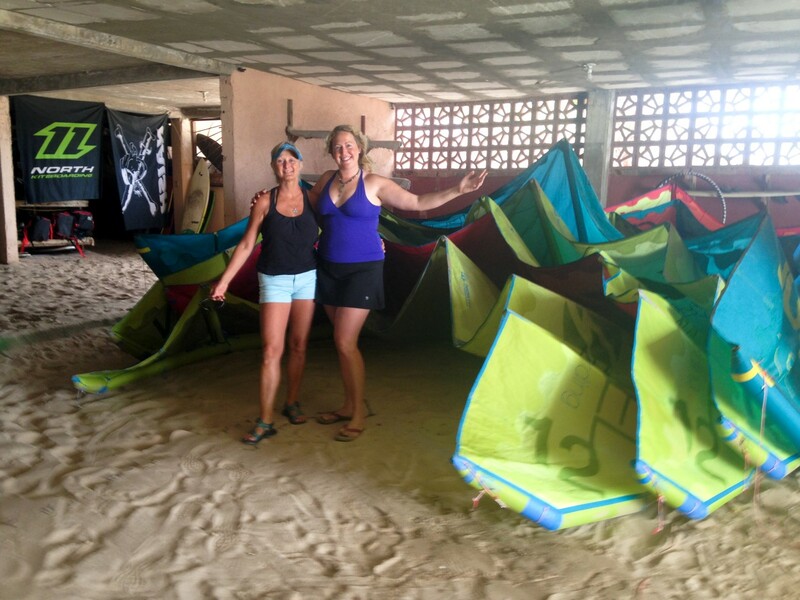 She spent the first day of the women’s kiting camp teaching us to fly kites on land. I immediately felt at ease with her. She explained everything in detail before we ever touched the kite. She answered our questions thoughtfully. Best of all, she loves kiting and it’s her life. She travels around giving lessons and even won a freestyle kite boarding competition recently! 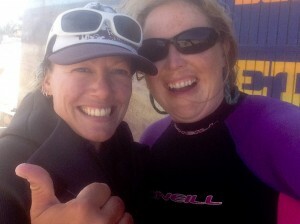 Our first lesson began 30 minutes late because she was being interviewed for kite boarder magazine. For her, this was more than a job. She was sharing her passion with us, and I could feel her quiet enthusiasm. Over the next few days Kris gently helped me through every hesitation I had with kiting and I began making good progress. I had much better kite control, too, and felt competent flying the kite alone. When I choked on sea water, she suggested breathing between the waves. 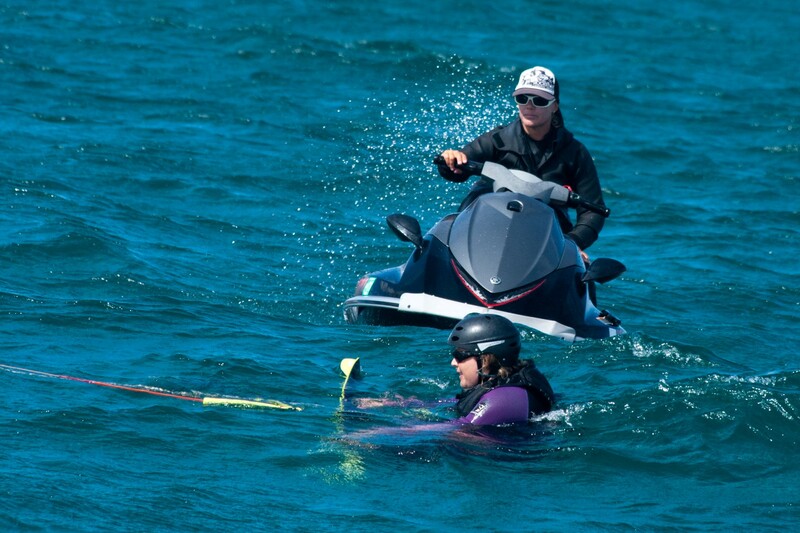 She introduced me to the board, and I tried my first water starts with the kite pulling me up onto the board. I even got a couple short and clumsy rides, and they were incredibly exhilarating! I got up on the board on my last day in La Ventana, with Kris by my side on a jetski. 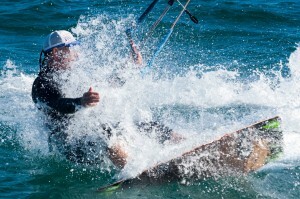 I hooted with joy, then crashed both the board and kite with a big splash. Crashing was not so bad, because as soon as I let go of the kite bar the kite lost nearly all of its power. The water made for a relatively soft landing. I made a lot of progress with Kris and felt like all my effort was paying off. 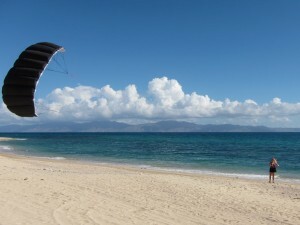 I learned the kite, overcame my fears and found a great instructor. I felt so much gratitude. How do you thank someone for rekindling a dying dream? I couldn’t find the words when I climbed off her jetski after my last lesson. But hopefully she’ll read this and will know how much it meant to me. During my retreat from kiting, I did a lot of internet research. It’s typical to spend an entire season clutzing around with the kite, crashing often and feeling incompetent before becoming an independent kiteboarder. No one tells you this when you take lessons, but it was all over internet forums as I read about people’s experiences. 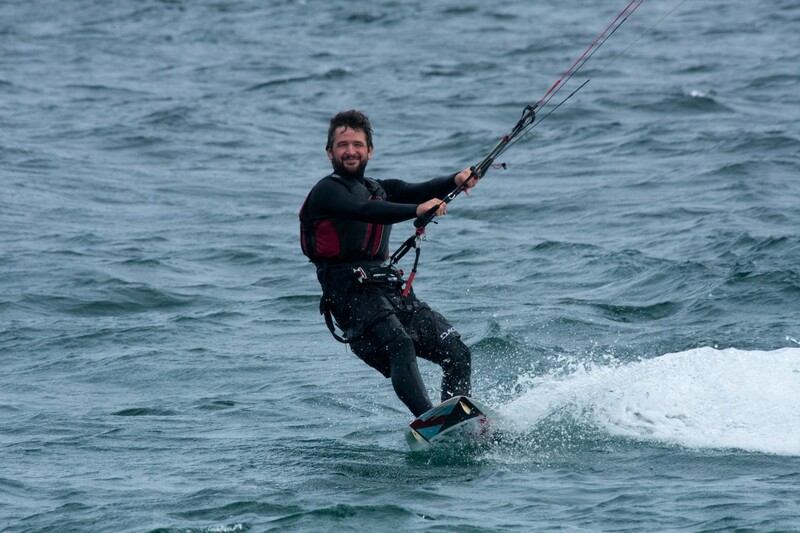 Why are all these lies circulating about how easy it is to learn kite boarding? 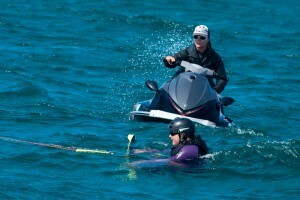 Kite boarders want to share the sport. It’s incredible, and they know it. 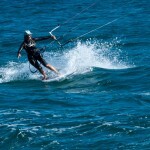 Learning to kite board is worth a hefty investment of time and money, and I felt that once I was up on the board. This sport has an incredibly steep learning curve, especially for someone like me with no prior experience. Some people would never try kite boarding if they knew they would invest over $1000 just to gain the skills for basic, clumsy riding. But even basic, clumsy riding gets you so high you feel like you’re floating for the rest of the day. 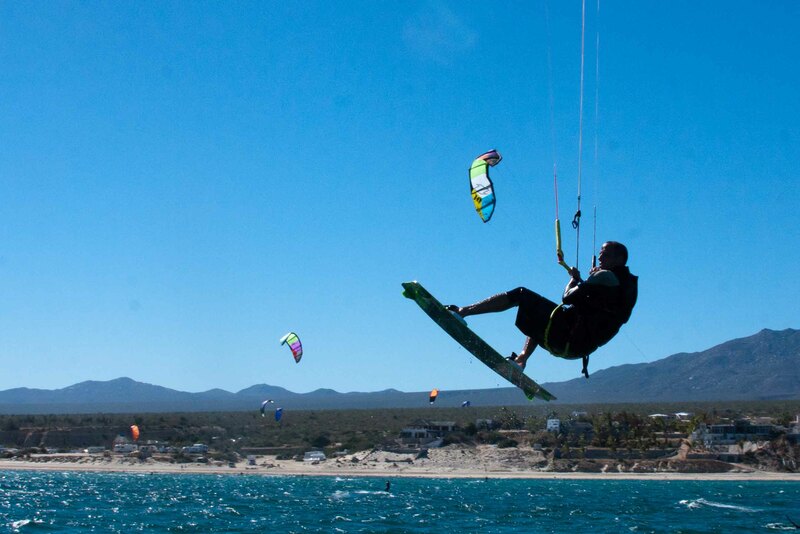 You wake up thinking about kite boarding and when you can do it again. It gets into your soul pretty quickly, this kite boarding sport. Dear La Ventana! You have stolen our hearts. Thank you for welcoming us into your community and sharing the stoke of kiting. I loved seeing you kite all around our boat. 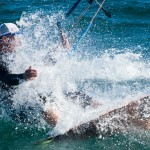 I created a photo gallery to show the essence of kiting. The big splashes, big jumps, big smiles, and facial grimaces show the intensity and joy of this wonderful sport. I’ve been taking lessons and got my first ride while here in La Ventana! 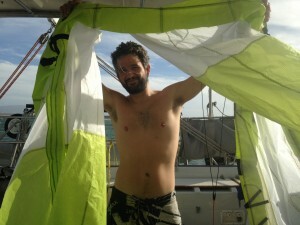 My husband, Brian, already knew how to kite when we came here, and has made a lot of progress during our six week stay. We’ve never spent so much time anchored in one place. It’s been a wonderful experience, and we look forward to returning. We are committed to meeting a friend in Puerto Vallarta and we leave this morning to cross the Sea of Cortez for mainland fun. Keep enjoying this awesome community, bay and wind. We miss you already!